Manufacturers in the sun care industry are primarily concerned with after sun exposure, sun protection products. The main focus of manufacturers is to provide after sun products that can absorb Ultraviolet (UV) rays and protect skin from various problems. With the rising demand from consumers, manufacturers are introducing multi-functional products with waterproof protection, long-lasting effect, etc. Development of these products is centered around the use of ingredients such as zinc oxide and titanium dioxide. These ingredients help in producing better products. Also, against the backdrop of increasing concerns over allergic reactions and toxicity due to the chemicals in the after sun products, the formulations including natural and organic ingredients are being produced on a large scale. After sun products for sensitive skin including various ingredients such as GMO free and hypo-allergic oat ingredients, with mild formula are also being used on a large scale. Use of sun care products in form of sheet masks is also increasing offering cooling and soothing experience. However, in the recent years, BB creams acting as the foundation for makeup, moisturizer, and sunblock have become popular among the consumers. The increasing demand for such creams can hamper the growth of the after sun products. Hence, researchers are focusing on developing better after sun products with added skin care benefits. Leading companies in the global after sun products market are Christian Dior SE, Unilever PLC, The Estee Lauder Companies Inc., The Procter & Gamble Company, Shiseido Co., Ltd, Kao Corporation, Avon Products, Inc., Johnson & Johnson Services, Inc., Beiersdorf Aktiengesellschaft, and L'Oréal S.A.
A new study by Transparency Market Research (TMR) projects the global after-sun products market to experience sluggish growth throughout the forecast period. The market is estimated to grow at a CAGR of 3.4%. The global after sun products market is also estimated to generate revenue of US$ 2,928.7 million by the end of 2026. The market for after-sun products is segmented on the basis of end users, product type, source, sales channel, and region. On the basis of the product type, among various after-sun products, cream and lotion is expected to be the largest segment witnessing the highest growth. The end users segment is further divided into female and male. Female as the end users are expected to witness the highest growth as compared to the male segment. Based on the sales channel, modern trade is expected to be the largest sales channel in the global after-sun products market. By source, the market is further segmented into natural and organic, and conventional. Among these two sources, the conventional source is expected to witness growth during the forecast period. Among various regions, Europe is expected to remain dominant in the global after-sun products market. Countries such as Germany, U.K., and France are anticipated to witness the highest growth. 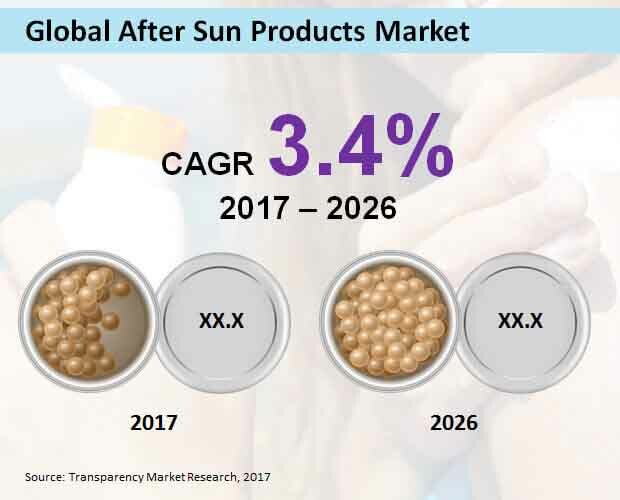 Several factors such as growing skin concerns, increasing awareness about after-sun products, and ongoing research and development activities to produce better after-sun products are driving the growth of the market in the region. The region is also witnessing increasing demand for after-sun products due to the harsh climatic conditions. Also, producers of after-sun products are introducing products with an attractive texture, easy-to-apply, and protection against pollution and skin aging.